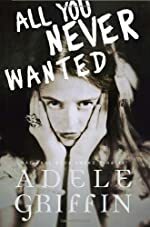 All You Never Wanted by Adele Griffin. Review: Two sisters, one beautiful and popular, but plagued by fear; the other has her intelligence, but is only a shell of her older sister. In All You Never Wanted by Adele Griffin, Alex and Thea Parrott work to come to grips with the weaknesses that control their very existence. Alex Parrott has everything, and now that her mother has remarried, she has more money than she can ever imagine. But, a horrific event has changed her. She has stopped eating, avoids drinking anything, and keeps herself tied to her home. This event completely controls her life to the point that she is at risk of losing everything. Thea Parrott wants too much to change her image from the Òsmart girlÓ to someone more like Alex. She becomes a chronic liar as she tries so desperately to work her way into the inner circle at school. As she gets closer to achieving her goal, her lies start to tear her apart. Thea's greatest accomplishment is the party of the year; she just has to get Alex to agree. Through unexpected romance and the party that Thea and Alex's boyfriend have planned, the Parrott girls' lives are turned upside down. What sisters haven't secretly coveted what their sister has and they're lacking? They see their sister's attributes as better than their own. In All You Never Wanted, this desire is taken to an alarming level as Thea's own identity disappears when she realizes she will never be her sister. The novel is written chapters that alternate between Thea and Alex. This is confusing at first in that Thea's chapters are written in first person and Alex's chapters are written in third person. Oddly this fact easily goes unnoticed. However, once readers come to understand the format, it proves to be highly effective. Readers get insight into how Thea feels about herself and how she views Alex. Both girls' lives are exciting and tragic in their own ways, and teen girls are destined to find a little bit of themselves in Alex and Thea. The final caveat to All You Never Wanted is the surprising ending. Adele Griffin has truly captured the hopes, dreams and fears of teenage girls. We would like to thank Random House for providing a copy of All You Never Wanted for this review. Have you read All You Never Wanted? How would you rate it?